These chairs are nothing like the egg chairs we showed you almost a year ago. 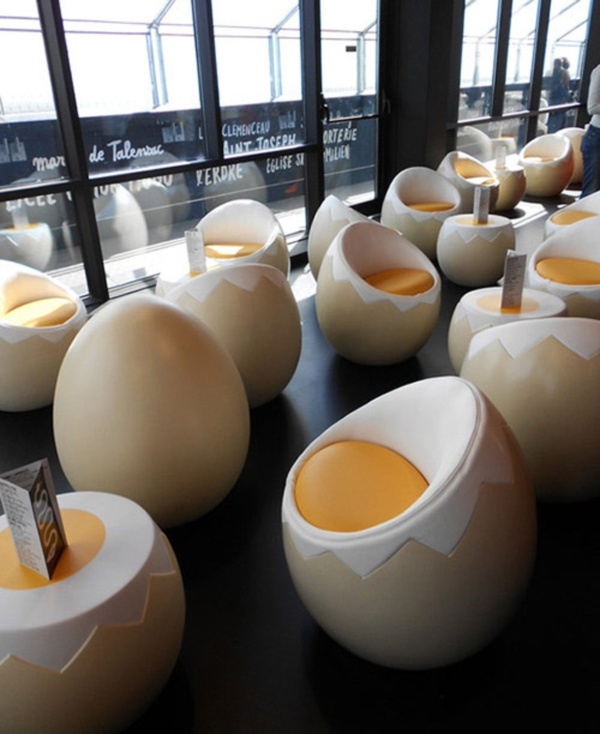 This time around, these chairs are for human seating and not for your hard-boiled (or soft-boiled) eggs. These matching egg chair and table sets weren’t made for some cafe or restaurant. Rather, they’re actually what you’ll find in Le Nid, which is a hip and very unusual bar located at the top of the Brittany Tower in France, which overlooks the entire city of Nantes. Le Nid, which is French for ‘the nest’, definitely goes all out with its nest theme, since the bar is actually located inside the body of a huge, long-necked bird. Le Nid was designed by French graphic designer, Jean Jullien.